TAMPA — The Packers can clinch a playoff spot for the sixth consecutive season with a win over the Tampa Bay Buccaneers at Raymond James Stadium today. That’s the biggest fallout from Saturday’s loss by the Eagles to the Redskins. That result clinched a playoff spot for the Lions and puts the Packers one win away from clinching. If the Packers do earn that playoff spot today, next week’s game vs. Detroit at Lambeau Field would be to decide which NFC North team goes into the playoffs as the division champion and which goes in as a wild card. If the Packers lose today, the Lions can clinch the division title with a win over the Bears. The other game factoring into Green Bay’s playoff scenarios today is the prime-time NFC West showdown between Arizona and Seattle. If the Cardinals win, they lock up the No. 1 seed for the playoffs. If the Seahawks win, they control their own destiny for the No. 1 seed and would get it by winning again next week. The Packers control their fate as it relates to a first-round playoff bye. If Green Bay wins its final two games, it will be no worse than the No. 2 seed, will earn a first-round bye and will play at home on the divisional playoff weekend (Jan. 10-11). Weather update: Temperatures are in the mid to high 70s today in Tampa with clouds and very light winds. There is a chance for rain, but not until later in the day, most likely toward the very end of the game or after it is over. Up front: The Packers are expected to have their starting offensive line intact for the 13th consecutive game. RT Bryan Bulaga, who left last week’s game in the fourth quarter with a concussion, was upgraded from questionable to probable on the injury report on Saturday, a sign that he has gained medical clearance through the concussion protocol. Bulaga is the only starter on the offensive line to have missed a game this season, and it came way back in Week 2. Since Week 3, the group of Bulaga and David Bakhtiari at the tackles, Josh Sitton and T.J. Lang at the guards, and rookie Corey Linsley at center has started every game. Quasi-home game? : It will be tough to tell until the game gets going, but some estimates say Raymond James Stadium could feature 50 percent Packers fans today. 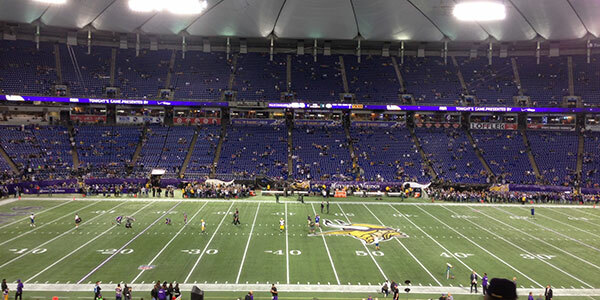 The stadium holds approximately 66,000 people, so that could mean as many as 30,000 Green Bay fans in attendance. The Packers are 3-4 on the road this season and will look to end their regular-season road slate with a .500 mark. MIAMI — There are a few clouds in the sky, but rain is looking less and less likely at Sun Life Stadium today, with temperatures expected to be in the mid-80s. It’s going to be a hot one. Winds are around 10 mph and the humidity is between 60-70 percent. The small chances of rain predicted earlier in the week are still in the forecast, but are projected for the evening, not the afternoon. As they did eight years ago in their last visit to Miami, the Packers are wearing their green jerseys today while the Dolphins will be wearing their whites. For a look back at that Packers-Dolphins game from 2006 and how it might relate to what happens today, click here. Injury update: Packers DE Datone Jones (ankle) is inactive today, and he will be replaced in the starting lineup by DE Josh Boyd, who returned to practice this week after missing some time with a knee injury. WR Jarrett Boykin (groin) remains out for the Packers, while WR Kevin Dorsey is active for the first time in his pro career. The Packers have five WRs active today — Jordy Nelson, Randall Cobb, Davante Adams, Jeff Janis and Dorsey. For the Dolphins, RB Knowshon Moreno is active after missing time due to an elbow injury, and Pro Bowl C Mike Pouncey is also back in the starting lineup, but he will be at guard. Moreno and Lamar Miller are both averaging at least 5.0 yards per carry this season for the Dolphins, who have one of the league’s top running games. In the NFC North: All four teams in the division are within one game of each other heading into today’s games. The Packers and Lions are tied atop the division at 3-2, while the Bears and Vikings are one game back at 2-3. If they Packers win, they would end the day no worse than tied for first, depending on what the Lions do in Minnesota. 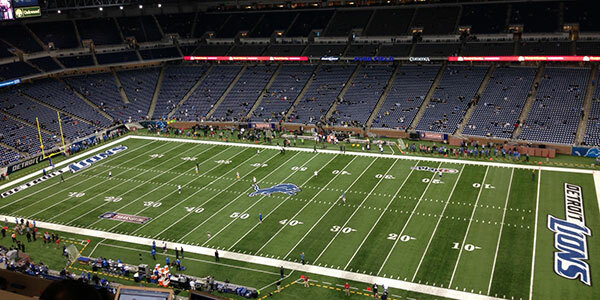 WR Calvin Johnson and RB Reggie Bush are both inactive today for Detroit. Chicago plays at Atlanta later Sunday afternoon. It’s possible the day could end with all four teams tied for first. For that to happen, the Packers would have to lose while the Vikings and Bears both win. 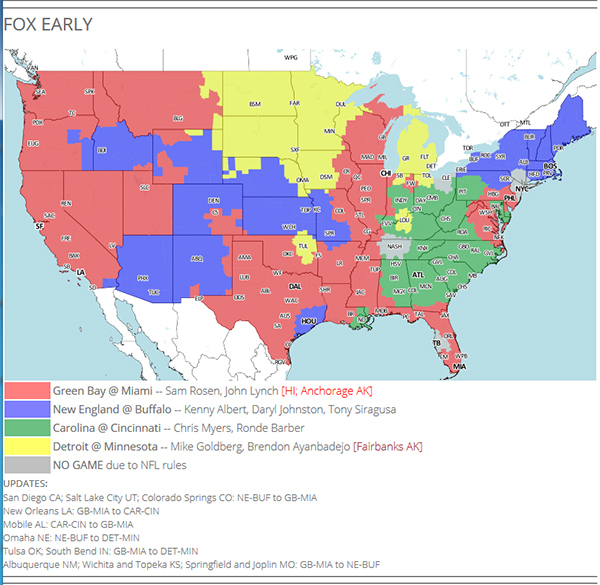 TV map: Here’s a look at the portions of the country that will get the Packers-Dolphins broadcast on their local FOX affiliates. 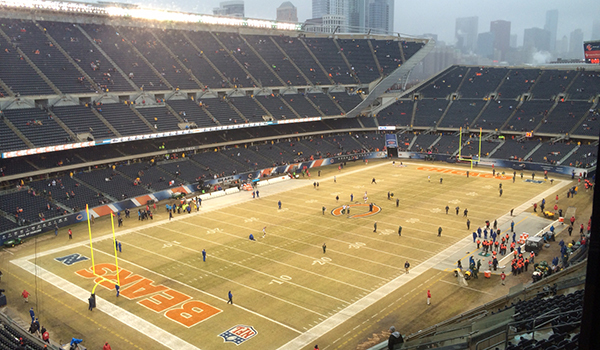 With kickoff less than an hour away, here’s a final rundown on Packers-Bears from Soldier Field. 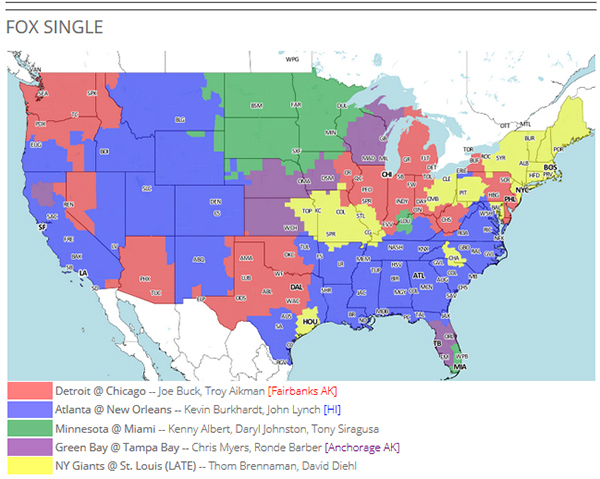 The winner of this game wins the NFC North and will host a playoff game next weekend. If the Packers win, they would be the No. 4 seed in the NFC. If the Bears win, they could be either the No. 3 or 4 seed depending on the Eagles-Cowboys result later Sunday night. 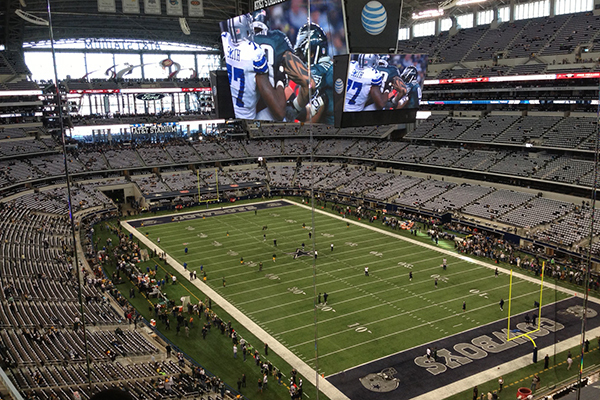 For more on the NFC playoff possibilities on the final Sunday of the regular season, click here. QB Aaron Rodgers hasn’t played since Nov. 4 and WR Randall Cobb hasn’t played since Oct. 13, but both are back for this showdown with a playoff berth at stake. Rodgers’ availability has been a week-to-week sage, while Cobb just returned to practice two weeks ago but has shown enough to be activated from temporary injured reserve. The last time the two were on the field together was in the first half at Baltimore back on Oct. 13, and other than the first series of the first Chicago game on Nov. 4, both players missed the earlier meeting with the Bears this season. It’s not a pleasant day in Chicago. Temperatures are in the high 20s and expected to drop throughout the game. Winds are around 20 mph or more, and there’s been a steady drizzle during pregame. Expect the conditions to have an impact on this game. Packers WR James Jones needs just nine receiving yards today to set a new single-season career high. Jones had 784 yards last year. LB A.J. Hawk, with 1,010 career tackles, needs just five more to move past Nick Barnett for No. 2 on the all-time franchise list. Hawk also needs just 11 more tackles to surpass John Anderson for the top spot. Tackles have been an official statistic only since 1975. The Packers knew they were coming into this game without LB Clay Matthews (thumb), but LB Brad Jones was a surprise pre-game scratch despite being probable on the injury report with an ankle injury. LB Jamari Lattimore is replacing Jones in the starting lineup at ILB, while the Packers will be starting Mike Neal and rookie Andy Mulumba at OLB. Nick Perry is also active and expected to play at OLB. The Packers are without QB Aaron Rodgers for a sixth straight start, but after having several other players miss practice on Wednesday and Thursday, the Packers are getting healthier. RB Eddie Lacy (ankle), LB Brad Jones (ankle) and LB Jamari Lattimore (knee), none of whom practiced until Friday this week, are all active and expected to play their usual roles. As a hedge with Lacy, the Packers also have newly acquired RB Kahlil Bell active for the first time. He’s the No. 3 RB behind Lacy and James Starks. The Cowboys aren’t as fortunate in the health department, particularly on defense. Three starters — LBs Sean Lee and Bruce Carter, plus CB Morris Claiborne — are out on a unit that has struggled this season and is coming off one of its worst performances, when it allowed the Chicago Bears to score points on eight straight possessions last Monday night. Reserve LBs Kyle Wilber and Ernie Sims enter the starting lineup for the Cowboys, along with nickel CB Orlando Scandrick. The Cowboys are also missing their primary return man, WR Dwayne Harris, due to injury. He will most likely be replaced by WR Cole Beasley on special teams. The Packers are looking to end this weekend no worse than where they are now — a half game out of the division lead. The front-running Lions don’t play until Monday night at home against the Ravens, but that doesn’t lessen the importance of this game for Green Bay. The best-case scenario for the Packers is to win and have the Lions lose. That would put Green Bay in control of its own destiny with two games left. Should the Packers lose, it would obviously help if both the Bears and Lions also lost, which would keep Green Bay a half game back. For more on all the playoff scenarios involving the Packers, click here. The Packers haven’t beaten the Cowboys on the road since 1989, but they did of course win Super Bowl XLV here in AT&T Stadium three years ago. How have the Packers fared the first time they’ve returned to the place of a Super Bowl triumph? Click here to find out. The Packers played last week without DE Johnny Jolly, and they’ve played multiple games now without CB Sam Shields and LB Nick Perry, but all three are active and slated to play today. Jolly and Perry might be able to help shore up what has been a leaky run defense in recent weeks, while Shields is sure to see plenty of Lions WR Calvin Johnson throughout the day. The Packers offensive line is back to full strength as well, with RT Don Barclay returning from a knee injury. He had been replaced by Marshall Newhouse the past couple of games. The Lions are currently tied with the Bears atop the NFC North at 6-5, with the Packers one-half game behind at 5-5-1. If the Packers win, they would put themselves in position to control their own destiny in terms of trying to win the division. Should the Packers win, they would still be technically behind the Bears pending Sunday’s Chicago-Minnesota game. But if the Packers were to win the rest of their games, including the regular-season finale at Chicago, they would win the NFC North. If the Packers lose, they would have to win their remaining four games and have the Lions and Bears each lose twice in order to claim a third straight division title. The Lions have lost nine straight games on Thanksgiving, including three to the Packers over that span in 2007, ’09 and ’11. Detroit’s last win on Thanksgiving came against Green Bay in 2003. As for this season, Detroit comes into today’s game in a two-game losing streak, while Green Bay hasn’t won in its last four contests (0-3-1). Packers QB Matt Flynn made his NFL regular-season debut at Ford Field back in 2010, coming off the bench in place of Aaron Rodgers when Rodgers sustained a concussion. The Packers lost that game, 7-3. A little more than a year later, Flynn started in Week 17 at Lambeau Field against Detroit and threw for franchise records of 480 yards and six TDs in a 45-41 victory. All eyes will obviously be on players like Flynn, Detroit QB Matthew Stafford and Johnson, and the battle in the trenches between the likes of Packers G Josh Sitton and Detroit’s defensive linemen, who were the subject of some disparaging comments by Sitton earlier this week. But here’s another player to watch: Detroit return man Jeremy Ross. Ross began the season with the Packers as their primary return man, but a fumble on a kickoff in Cincinnati cost him his job. He was signed to the Lions practice squad and later elevated to the active roster. He has now assumed full-time return duties for Detroit, and he had a 42-yard punt return in the Lions loss to the Buccaneers last Sunday. There are a lot of chips on shoulders, you might say, in today’s game, and Ross is wearing one of them. With kickoff less than an hour away, here’s the final rundown on what matters tonight from the Metrodome. Detroit’s dramatic, come-from behind 31-30 victory over Dallas earlier on Sunday forces the Packers to have to win in order to remain in first place in the NFC North. The Lions are now 5-3, with the Packers trying to get to 5-2 by beating the Vikings. Should the Packers lose, they would fall into a second-place tie with idle Chicago (bye this week) at 4-3. Tonight’s game begins a stretch of four NFC North games for the Packers in their next six contests. Following tonight’s game, Green Bay hosts Chicago on Monday night and then, after two games against NFC East foes Philadelphia and the N.Y. Giants, the Packers host Minnesota on Nov. 24 and then travel to Detroit on Thanksgiving. The Packers will once again be without OLBs Clay Matthews and Nick Perry tonight, leaving Mike Neal, Andy Mulumba and Nate Palmer as the only healthy players at that position. Perry returned to practice on Friday on a limited basis and was questionable to play with his foot injury, but he is inactive. WR James Jones also is not returning to action tonight. That leaves the Packers with Jordy Nelson as the only regular starting WR in the lineup. Green Bay also is a little thinner than normal at TE, with both Jermichael Finley and Ryan Taylor sidelined. Due to Josh Freeman’s concussion, the Vikings are turning back to QB Christian Ponder, the third different QB to start for the Vikings in their last three games, following Matt Cassel and Freeman. Ponder has started four career games against the Packers, going 1-3. He lost his first three attempts before beating the Packers in Week 17 last season to get Minnesota into the playoffs. In that game, Ponder threw three TD passes a posted a 120.2 passer rating, the highest of his career. For a closer look at Ponder’s numbers against the Packers, scroll down to the chart at the bottom of this story. The above link will also provide all of Minnesota RB Adrian Peterson’s rushing statistics in his career against the Packers. Peterson rushed for 508 yards in three games against Green Bay last season, an average of 169.3 per game. His previous best in one season against the Packers came in 2008, when he averaged 145.5 in two games. For those interested in fashion, the Vikings will be wearing all purple uniforms tonight — purple pants and purple jerseys, along with their usual purple helmets. The Packers will try to get their first road win since Week 15 of last season today at Baltimore’s M&T Bank Stadium. LB Clay Matthews (broken thumb) is out for the first of what may be 3-4 games, leaving Nick Perry and Mike Neal to start at the outside linebacker spots. The duo combined for three sacks vs. Detroit last week, including two from Perry, who got both of his sacks from Matthews’ spot on the right side of the defense. The Ravens will start a new LT today, former Jacksonville first-round draft pick Eugene Monroe, to replace veteran Bryant McKinnie, who is inactive. The Perry vs. Monroe matchup will be key. At 2-2, the Packers are looking to get above .500 for the first time this season and need a win to stay one-half game behind the Bears in the NFC North race. Chicago is already 4-2 following a Thursday night win over the Giants. Detroit (3-2) will look to stay even with the Bears with a road game at Cleveland, the Packers’ opponent next week. Lions WR Calvin Johnson, who missed last week’s game against the Packers, is active and will play. Minnesota (1-3) hosts Carolina, and Vikings RB Adrian Peterson has said he’ll play despite the death earlier this week of his 2-year-old son. Peterson is active for the game. It’s drizzing in Baltimore during pregame, but the rain is expected to stop by kickoff. The day’s forecast calls for clouds with temperatures in the 60s and winds at 10-12 mph. With the Packers’ injuries at linebacker, some shuffling will be required on the special-teams units. Jamari Lattimore is starting at inside linebacker in place of Brad Jones, so his absence on special teams, along with the absence of Robert Francois — who is out for the season — likely elevates rookie Sam Barrington into a special-teams role, along with outside LBs Andy Mulumba and Nate Palmer, also rookies. Also, special-teams ace Jarrett Bush is out with a hamstring injury, with recent practice-squad signing James Nixon now on the active roster. Adjusting on special teams is part of the game in the NFL, and the Packers will be counting on a greater number of rookies than usual on the return and coverage units today.